In a recent blog post, we shared the remarkable story of the K9s For Warriors program, which has been partnering veterans with dogs to help them manage their PTSD symptoms. The program has been a huge success, with hundreds of veterans and hundreds of dogs finding a new path together, preventing veterans from resorting to self-harm or suicide as a way of dealing with their PTSD. 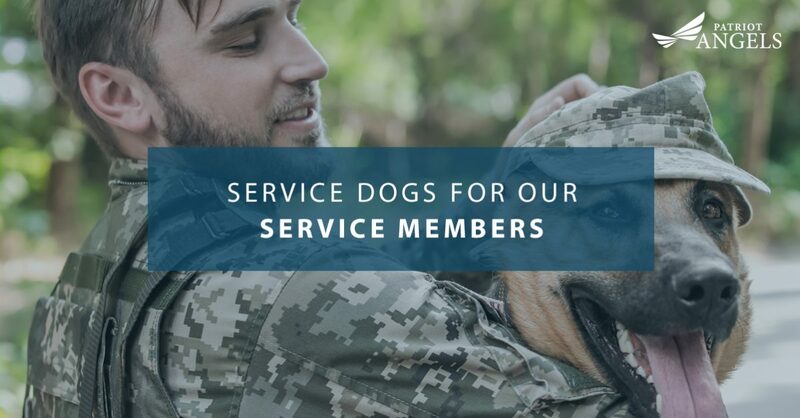 In today’s blog, Patriot Angels will discuss why more and more veterans are bringing dogs into their lives as a way to transition into post-military life. While there is still ongoing research into the effectiveness of pairing veterans with dogs, many studies are showing promising results. Working with a caring canine companion is proving to be a great treatment alternative to those who have found fewer results in using traditional talk therapy or medications. Pet owners already know that having a dog brings a unique sense of joy and connection that is difficult to find anywhere else. For veterans who are experiencing emotional turmoil, having a loving animal in their life can be of enormous benefit to their mental health. Dogs help to bring out feelings of love in their owners. Dogs are naturally excited to be a companion to humans and are ready to work with them. For veterans who are used to giving and receiving orders in the military, having a dog who is excited to follow orders can be a great way to have a sense of control over their life. Of course, dogs are just fun to be around and do a great job of bringing veterans out of their house to go on walks or play in the park. Finally, service dogs provide veterans a sense of identity is more than just their time in the service. It’s easier for people to relate to dog owners than to relate to military service, so veterans are better able to connect with others when they have a dog with them. The process of recovering from PTSD is a long and complicated one. Treatment that is effective for some isn’t for others. Ultimately, all PTSD treatment options are designed with one goal in mind: helping veterans better navigate their post-military life and accomplish the tasks they may have avoided due to their PTSD. While service dogs may be a wonderful way for veterans to better manage their PTSD, they should be a supplement to their existing PTSD treatments and not serve as a substitute. If you or a loved one is in need of added care as a result of their service, reach out to Patriot Angels. We can help you get care you need thanks to the VA Aid and Attendance pension. If you feel that you or a veteran could benefit from the work of our friends at K9s For Warriors, don’t hesitate to reach out to them.